Good morning everybody...it's Monday, and here's some #MondayMotivation to get your week started off right! The road to success is HARD, y'all. Very hard. No matter what you're working towards. Maybe it's getting healthier. Maybe it's building up your own business. Maybe it's trying to get that degree. No matter what it is, the journey to reaching a goal is quite difficult and tiring. Yet and still, you can't stop when you're tired. When you stop every time you're tired, you're just prolonging the process of getting further along in your journey. You have to choose to push past feelings of fatigue, or insecurity, or doubt, to continue towards your purpose. If it was easy, everybody would do it. 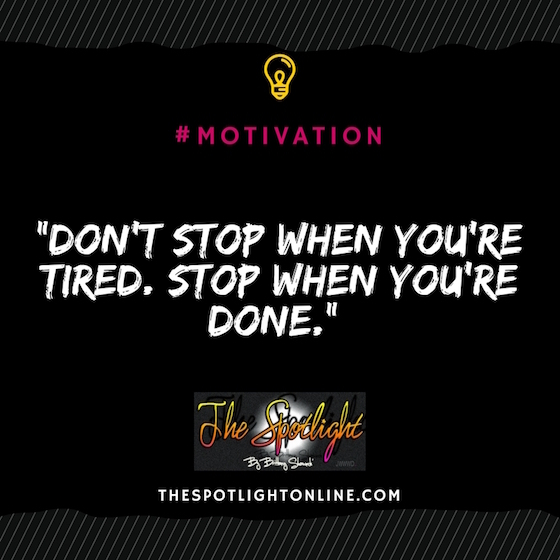 So don't stop when you're tired...stop when you're done.